Geraniums are one of the world's most popular summer bedding plants and have been so for over 150 years. Disease resistant, tolerant of drought and available in a very wide range of flower colours, it is easy to see why geraniums have remained as popular as they have ever been. 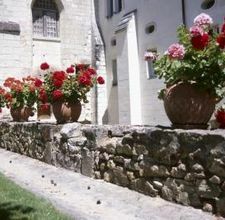 However, purchasing geraniums can be expensive, but there is an alternative. 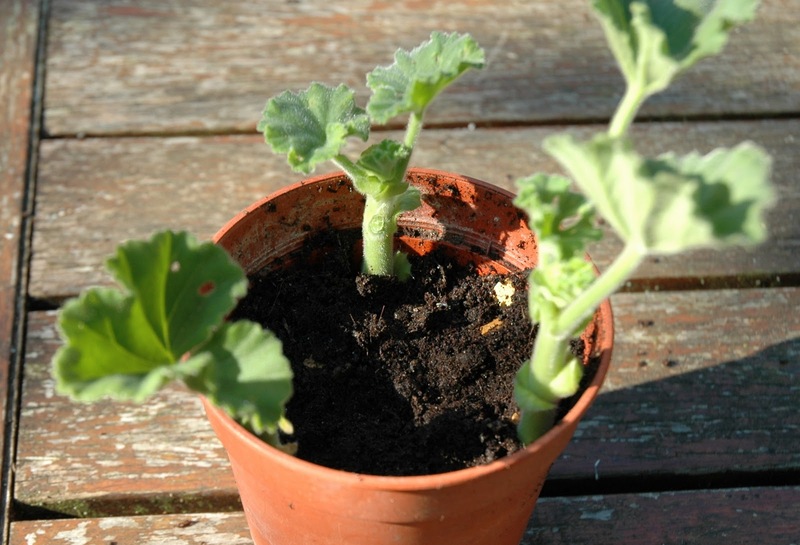 Why not implement some forward planning and propagate your own geraniums from cuttings? That way you will get exactly the right varieties you fancy and as much free (relatively free) stock as you like. Not only for next year, but for as many years as your heart desires! Just how do you take cuttings from geraniums? As with most things timing is all important, and when it comes to taking geranium cuttings you will need be looking at doing so at the end of the summer. But before you start, make sure that all of your tools are sterilised as geraniums can be very susceptible to fungal diseases during propagation. With this in mind, the pots you are going to use for your cuttings should also be sterilised and this can be achieved by washing them in a very mild bleach solution. This is particularly important with used pots. Just remember that whatever pots you end up using rinse them thoroughly with tap water after the sterilisation process. 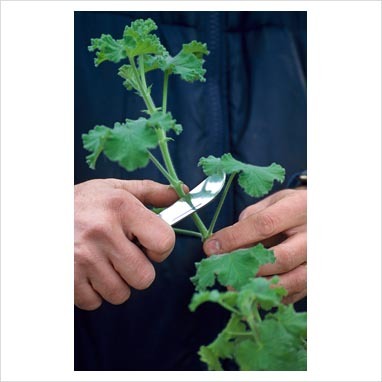 Make a cut about four or five inches down from one of the growing tips of the plant, just below a leaf joint. Now remove all of the leaves on the plant cutting with the exception of the top three to five leaves. If the cutting has any flower heads on it these should be removed so that the cutting can direct all of its energy into rooting. Now there are two way to continue from here. 2. 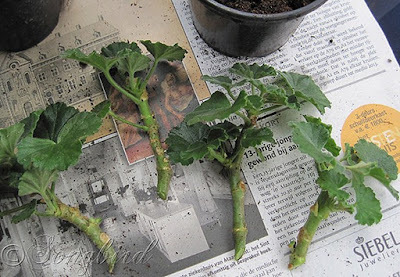 Allow the cuttings to be stored loosely within some old newspaper for 3-7 days so that a callus can form on the cut end before potting on. Whatever you decide, continue by placing approximately 3 cuttings per 3 inch pot. I would recommend terracotta pots for this and try to place the cuttings at the very edge of the pot. Allow a good inch gap from the soil surface to the top of the pot and add ¼ inch of horticultural grit to its surface. Water in and move to a bright windowsill of greenhouse but keep it out of direct sunlight. Also try to make sure that there is good ventilation as this will also help to reduce the incidence of fungal infection. Allow the cuttings to dry out between watering, but make sure that the soil is never waterlogged! Apart from this, the next consideration is to make sure that the temperature doesn't fluctuate too much between day and night. Cold temperature in particular can increase the risk of fungal infections. If you do see the beginnings of a fungal infection apply a liquid fungicide such as Benlate, but try to do so when the soil is relatively dry. With a bit of luck, the cuttings should root in about 10 to 20 days. Once rooted they will need to be transferred into there own 3-4 inch pots using a standard potting compost. Again, you may wish to add some horticultural grit or perlite to ensure good drainage. Once your cuttings have rooted, pinch out the top to encourage the new plant to produce side shoots. Overwinter in a frost free area and keep on the dry side. That way there will be in perfect condition to take advantage of next year’s summer. 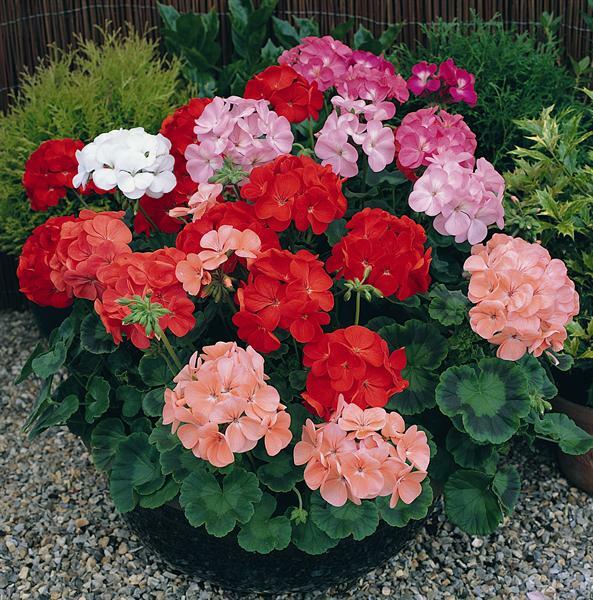 For more about overwintering geraniums click here. CAN YOU REPLANT A CUT CHRISTMAS TREE?